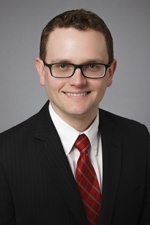 Carson Griffis is an appellate attorney who has briefed and argued cases in several different districts of the Illinois Appellate Court, as well as the U.S. Court of Appeals for the Seventh Circuit. He also applies his writing and analytical skills at the trial court level, developing litigation strategies and drafting complex dispositive motions in a wide variety of cases, including government, professional liability, administrative review, and insurance coverage litigation. Prior to joining Hinshaw in March 2017, Carson served as a law clerk to the Honorable David W. Ellis and the Honorable James R. Epstein in the First District of the Illinois Appellate Court, where he assisted in the disposition of over 100 criminal and civil appeals involving complex legal issues. Before serving as a law clerk, Carson was an Assistant Appellate Defender in the Office of the State Appellate Defender where he pursued over 40 appeals on behalf of indigent criminal defendants and secured significant relief for several clients. Along with his other accomplishments, Carson graduated as valedictorian of his law school class. During law school, he worked as an extern to the Honorable Robert W. Gettleman, U.S. District Court for the Northern District of Illinois.